Welcome to the world of WAKFU! WAKFU is a French animated series, created by Ankama, acclaimed by critics and audiences. We wish to get closer to the American public, the Asian public... in other words, everyone in the world! That is why we are asking for your support to help us complete the dubbing of the series in English! For the most recent information about the project, including shipping and pledge rewards, please visit the Updates section. Click this button for answers to common questions. Created entirely within our studio located in Roubaix in northern France, the WAKFU series plays by its own rules: Total freedom of tone and impeccable quality! The final result was up to our expectations and those of the public, who have been a great support to us from the start. Today, we want to go beyond our borders and hope to bring WAKFU to your screen in your own language! For the dubbing to be perfect, we need you! Whether you’re a fan of animation in general, or someone who is already familiar with WAKFU the online video game, or even someone who may not know WAKFU yet but are seduced by this presentation page! Let's start from the beginning! We are offering you as our first goal, a complete English dub of WAKFU season 1, available on Blu-ray. If this goal is met, over 30 characters will find their English voice! But WAKFU also has a season 2 and even two special episodes made in Japan with the help of famous animation director and artists such as Eunyoung Choi, Michio Mihara and Masaaki Yusa! We can even go further in this adventure with Kickstarter and your support! WAKFU is also an ecological tale that allegorically explores the fragility of nature and the consequences that human actions may have on the ecosystem. Developed in Flash, WAKFU combines the latest technology with traditional animation. Using Flash ensures perfect fluidity and an optimum quality of animation for Yugo our hero, but also his friends (Percedal, Ruel, Amalia, Evangelyne and faithful Az)... and enemies! Our story starts here... A legend tells us that, in order to win the heart of a living doll, Ogrest (a titanic ogre) achieved the impossible: He united the six Dofus, very powerful Dragon eggs. But far from bringing him the happiness he was hoping for, the Dofus eggs made Ogrest into a destructive monster and an outcast who was rejected by his beloved ones. Even the Gods themselves tried to destroy him. Mad with rage and grief, Ogrest retreated to the highest peaks of the world to cry... And his tears engulfed the earth. This great deluge, which ended the Age of Dofus and transformed the continents into archipelagos, is now known as the "Ogrest Chaos." Even if the sages of the World of Twelve are still arguing about the causes of the cataclysm, everyone agrees that the world is not out of the woods yet: The seas continue to rise, nature is in revolt, vile creatures are appearing in the woods, and... most importantly, Wakfu, the primordial energy that created the world, is severely disrupted. In the middle of this uncertainty, tucked away in the heart of a bucolic forest, rests the small village of Emelka. This is where Yugo’s adventure begins! Yugo, a boy with mysterious origins and special magical powers goes in search of his real family, accompanied by a motley group of adventurers. For Yugo, an epic fantasy begins as the fate of the World also depends on the success of his quest! Yugo, the main character, has much to do! Surrounded by five rather comic sidekicks, he must show courage and selflessness to succeed in his quest. This adventure is also an opportunity for him to grow, to learn to master the mysterious magical possibilities of Wakfu energy (a little-understood type of magic with many benefits that he has yet to uncover...), discover a vast world and make new friends along the way. Exciting action, intriguing plots, fearsome enemies, and many surprises are on the WAKFU menu for you... Will this new crew of faithful and loyal friends reach the end of their incredible journey? In the Sadida Kingdom, the Tofu Brotherhood is slowly recovering from the great battle against Nox. By using the Eliacube, magical Eliatrope artifact, Yugo uncover the mystery of the disappearance of his people... and finally discover the way to find them again. A new quest begins for our friends. New adventures, new characters, new intrigues, fights, betrayals and friendships, will take us into a new season of WAKFU! Like all true heroes, despite large differences, the core characters of WAKFU form a united team in the face of adversity... Here are the members of "The Tofu Brotherhood!" If you have questions about the pledges, click here for more information! Please visit the Update Section of our project for the most recent information about shipping dates and pledge rewards. Ankama is foremost a human adventure! Founded by Anthony Roux, Camille Chafer and Emmanuel Darras in 2001, ANKAMA is an independent digital creative group working in the field of entertainment. ANKAMA creates rich narrative universes that are expanded and complimented through different type of media, also known as a "Transmedia" experience. This includes Video Games, Animation, Publishing, Press, and any other types of media necessary for Ankama to express themselves and offer a complete and interactive experience. In 2007, the animation studio was created and more than one hundred employees are now working on the production of Ankama’s animated series as well as short and full-length feature films. Creating an animated series like WAKFU requires much more than just a story on paper: it needs a large team of people with experience, expertise, and access to the right tools. Using “Flash,” a technology that Ankama has already mastered through the development of their flagship video game, allowed us to develop a new approach to the animated series; making ANKAMA an industry leader by creating this method. And it is all animated entirely in-house, in our own studios! Anthony Roux aka TOT - Ankama Founder and Creative Director -Co-writer and co-director of the WAKFU series. Author, screenwriter and director, Anthony Roux aka Tot is also the Creative Director and CEO of Ankama. From his imagination, came the Krosmoz, an colorful universe full of epic adventure and quirky humor. This universe has grown to encompass several eras, including those of DOFUS and WAKFU. Using new approaches, Ankama has opened the doors to this fantastic and endearing world utilizing several media outlets: Video Games, Comics, and Animated series. His passion has created the transmedia aspect of Ankama in which each project enriches the whole universe and the characters that populate it. With a background from the "School of Arts" in Tournai, he has surrounded himself with former schoolmates and other talented people to help expand the universe and develop new transmedia projects in parallel. After a brief interlude in production in his early career as an assistant director, Olivier Vannelle quickly turned to screenwriting. Olivier was an independent screenwriter for more than 10 years and worked on many animated series including Marsupilami, Funky Cops, Yakari or Mikido. In 2009, he joined Ankama to enrich the universe imagined by Anthony Roux. Together they created the WAKFU series with Olivier as the screenwriting director. After studying industrial design, Xavier Houssin completed a study in computer graphics, where he discovered Flash, the main tool of Ankama’s production teams. In 2003, Xavier joined Ankama to create animations and do a bit of programming for the video games. The graphic style of Ankama’s Krosmoz universe was born from his very first meeting with Anthony Roux. He draws his inspiration from many sources, particularly the culture of Japanese animation. 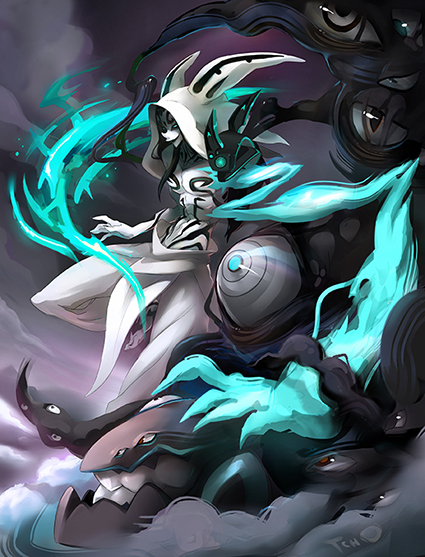 But the unique style which he developed gives his designs a very original identity, especially for the DOFUS and WAKFU characters, which he created with Anthony Roux and his colleagues. Created by fan for fans, the WAKFU series started out with great support from the French public. Thanks to the internet and online communities, the success of WAKFU has even crossed borders and you are likely to be one of many who has been waiting for this adaptation of the series into English! We have seen this on a daily basis at signing events, on forums, even at conventions where we have met our growing community. We are very attached to our characters and we want to see them evolve. Kickstarter gives us the opportunity to continue to keep these characters alive and dream that their new adventures will reach new audiences. Ideally, season1, season 2, and the two special episodes which have only aired in France so far will be able to be dubbed in English but we’re depending on you to tell us how high we can fly! For the WAKFU series to remain true to itself we wanted to make sure any English dub is of good quality, which is particularly expensive. Therefore we choose to use Kickstarter, which also allows us to get to know you directly and gives you a chance to get personally involved with a major animation project. We invite you to take on this challenge with us! If we are successful, this project will make WAKFU stronger worldwide. It will also allow us to offer the series for broadcast on all digital and VOD platforms. And if we can meet our stretch goals, not only will we be able to offer English and Spanish subtitles for all the episodes but we are also producing 3 exclusive episodes of 45 minutes each for French broadcasting that could also be dubbed into English. And who knows? If you tell us you’re ready, perhaps we could start to dream about the possibility of a Season 3! The campaign will cover the financing of part of the dubbing and the creation of the various backer rewards including the Blu-Rays and related content (episodes subtitles and bonus content, as well as creation of specific campaign bonuses). Dubbing will be done by a specialized studio; it will include more than 11 hours of dubbing (for Season 1) corresponding to more than 30 characters in the Wakfu series. Stretch Goal 1 Unlocked: Original French Audio with English, Spanish, and French subtitles. All features on the Blu-Ray will be produced in full 1080p resolution. This poster is 297 mm x 420 mm (or 11.7 inches x 16.5 inches). Nox's Hat - This item is not only a hat, but a complete costume that will allow your Wakfu character to dress-up as Nox! You may add these extra options to your pledge by clicking on the "Manage Your Pledge" button, then adding the combined dollar amount of the add-ons you would like to your pledge. At the end of the campaign, we will send out a survey where you can tell us exactly which artbooks you want. Thank you! This Blu-Ray pack contains all of the Wakfu content in the earlier Blu-Ray content list. We are offering this add-on for backers who might like a second copy of all of the Blu-Rays as a gift or who might want to stick with a pledge that does not contain a Blu-Ray. As a special reward bonus for reaching Stretch Goal 5, every pledge tier also includes one very special SMUG DUCK sticker for free. We are offering this add-on for backers who would like to have more than 1 Smug Duck Sticker or simply would like to acquire it separately from a pledge tier. If you made it all the way down here, thank you so much for your interest in our project. We love you! Due to our decade of experience creating attractive merchandise, we believe that the pledges offered to you will appeal to both fans of the series and fans of animation in general. We are prepared to answer any concerns or questions should any problems arise during production. Our goal is to give you the best experience possible during this campaign, we're here for you!